“In the first nine months of fiscal 2018 we faced an overall difficult economic environment. Negative currency effectsreduced group sales by more than 900 million euros in this period. Nevertheless, we continued to deliver profitable growth.We are committed to further drive the implementation of our strategic priorities,” said Hans Van Bylen. Henkel confirms its guidance for fiscal 2018. The company continues to expect organic sales growth of 2 to 4 percent for theHenkel Group. Henkel confirms its expectations of organic sales growth in the Adhesive Technologies business unit of 4 to 5percent. In the Beauty Care business unit Henkel confirms its expectation of positive organic sales growth of 0 to 2 percent.In the Laundry & Home Care business unit Henkel continues to expect growth in the range of 2 to 4 percent. 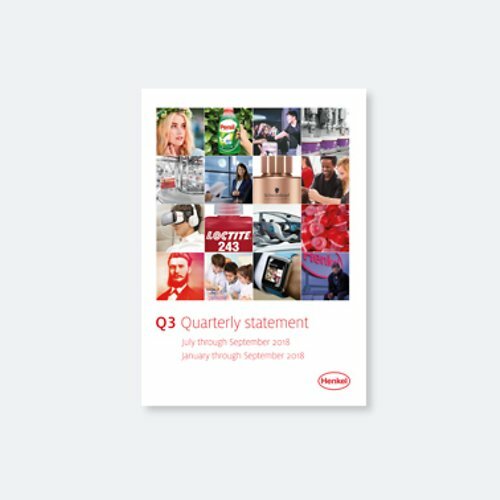 For adjusted return on sales (EBIT), Henkel continues to anticipate an increase year on year to around 18 percent. All threebusiness units are expected to contribute to this positive performance. Henkel confirms its expectation of an increase ofbetween 3 and 6 percent in adjusted earnings per preferred share. At 5,037 million euros, sales in the third quarter 2018 grew nominally by 1.1 percent compared to the prior-year quarter. Organicsales, which exclude the impact of currency effects and acquisitions/divestments, showed a good increase of 2.7 percent. The contribution from acquisitions and divestments amounted to 1.6 percent. Currency effects had a negative impact of -3.2 percent on sales. Adjusted operating profit (EBIT) improved by 3.3 percent from 897 million euros in the prior-year quarter to 926 million euros. Adjusted return on sales (EBIT) showed a strong increase and rose by 0.4 percentage points to 18.4 percent. The Beauty Care business unit registered positive organic sales growth of 0.5 percent. Nominally, sales increased by 5.5 percent to 993 million euros. Adjusted operating profit grew by 6.7 percent and reached 182 million euros. With 18.3 percent, adjustedreturn on sales showed a good increase of 0.2 percentage points. Sales in the consumer goods businesses were adversely affected by the delivery difficulties in North America. The Beauty Carebusiness unit showed a slightly negative organic sales development of -1.2 percent below the prior-year period. Adjusted return on sales developed positively and reached 17.7 percent. The Laundry & Home Care business unit generated good organic sales growth of 1.6 percent. Adjusted return on sales showed a very strong increase and reached 18.1 percent.